SYSE Review 2019: Is SYSE a Good Hosting? SYSE is a Norwegian hosting provider with more than 20 years of experience. The plans are expensive but easily customizable, so you only pay for the resources you need. SYSE is a Norwegian hosting provider that has been in business since 1995. Hosting is one of many website-related services it sells from its Norwegian language website. 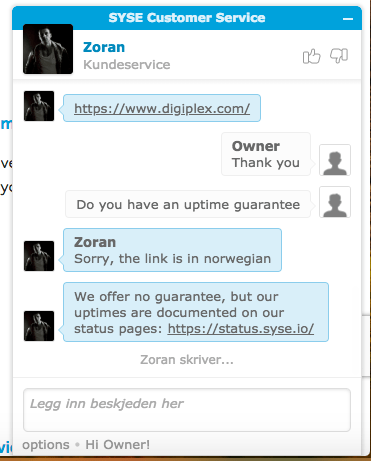 SYSE has its servers co-located in a Norwegian data center. It’s better if the company owns the data center and it’s a little disappointing that there isn’t a standard uptime guarantee. There is a page with the recorded uptime, however, and when I checked it was over 99.99%. The Tornado® control panel is custom built by SYSE and includes one-click installation of both WordPress and SSL. Unfortunately, with other providers offering a one-click installer for up to 400 programs, this offering feels a bit lackluster in comparison. The backup, on the other hand, is excellent. Automatic backups are taken, retained for 60 days, and can be restored, free of charge, by SYSE. It’s surprising how often this is an added cost, so it’s refreshing to see it included in the base plan. For experts, there’s support for PHP, SSH access, and Cron jobs to keep your website running optimally. The plans are relatively expensive compared to international companies, however, in line with similar Norwegian hosts. The main issues with the pricing are that you are limited to annual terms and there isn’t a money-back guarantee, so it feels like a big commitment when you first sign up. On the other hand, the added value with SYSE is that you can configure your plan as needed when you checkout – simply slide the scale to increase or decrease disk space and the number of databases. So, you only pay for the resources you need. Customer service is available by chat, Facebook, telephone, and email. The regular business hours are from 8:30 AM to 4:30 PM on weekdays, but for urgent support requests, you are able to contact the team 24/7 on Facebook. There’s a decent-sized help desk as well. I have chatted to the team a few times on live chat. Each time, I was pleased to speak with a helpful and warm operator, who was very happy to help me in English. SYSE has almost 170 positive reviews on the independent review website, Trustpilot. The plans don’t stand out in any one area, but it feels like a solid company with positive testimonials and excellent customer service. Wondering how SYSE stacks up against other Web Hosting companies? Enter any other Web Hosting company and we will give you a side-by-side comparison.